Hasso von Manteuffel’s Fifth Panzer Army had a strict timetable to reach the Meuse River during the Battle of the Bulge. The Americans wrecked it. The American airborne troops shivered in their foxholes as temperatures plummeted on Christmas Eve 1944. Behind them to the east lay the beleaguered town of Bastogne. They braced themselves for another German attack. Two and a half hours into Christmas morning the German heavy guns boomed loudly in the distance. Heavy shells screamed overhead and slammed into the snow-covered ground. Once the guns stopped, the American soldiers could see German grenadiers rushing furtively toward their positions. Earlier that day the 115th Panzer Grenadier Regiment had arrived to reinforce the elements of the German Fifth Panzer Army besieging Bastogne. An attack force, dubbed the 115th Kampfgruppe, consisting of four battalions of infantry, two battalions of armored field artillery, a company of self-propelled guns, and 18 tanks assembled to capture the town. At 5:30 AM, Colonel Wolfgang Maucke ordered his Panzer Mark IVs to advance southeast from their starting point between Flamierge and Givry toward Bastogne. The extreme conditions of the Ardennes winter tested the mettle of infantrymen on both sides. Men of the U.S. 106th Infantry Division fight from foxholes. The German and American infantry fought for control of key hills and villages such as Champs as Christmas Day dawned. In Champs, German grenadiers and American riflemen fought house to house. American reinforcements arrived to bolster the western portion of the perimeter, but they had difficulty seeing where to deploy in the weak light. After 90 minutes of fighting, the men of the U.S. 327th Glider Infantry Regiment heard the telltale sound of German tank suspensions clanking in the distance. From out of the darkness to the west the dreaded machines advanced in two columns with their machine guns chattering as they raked American targets. The left column of Maucke’s spearhead peeled off north to seize the village of Hemroulle while the right column proceeded due east for Bastogne. The German tanks in the right column pushed forward despite resistance from American tank destroyers and bazooka teams that sought desperately to knock them out. Three hours after they began, Maucke received a radio transmission informing him that the tanks of the right column had reached the western outskirts of Bastogne. The German commander was pleased with the news for he expected them to reach the center of the market town by 9 AM. The tanks moved from column to line abreast. They were nearing the 101st Airborne’s Command Post. A pair of tank destroyers knocked out three Mark IVs in quick succession. American bazooka teams moved up behind the German tanks and destroyed two more. The strength of the right column was dissipating rapidly in the face of a determined American counterattack. Meanwhile, the left prong ran headlong into both Sherman tanks of Colonel William Roberts’ Combat Command B (CCB) of the 10th Armored Division and four tank destroyers. To make matters worse, they also were fired on by American 105mm howitzer crews and mortar teams. The Americans had worked their way around both columns and surrounded them. While the Americans continued to feed men into the fight, the Germans received no reinforcements. Maucke heard no other news from his tank troops. By the end of Christmas Day, all 18 of Maucke’s tanks were flaming wrecks inside the American perimeter. A confident German SS panzergrenadier advances past a column of burning American vehicles at the outset of Operation Wacht am Rhein. A film with this image was found by the Americans. The morning attack on Christmas Day occurred nine days after the Germans unleashed a powerful winter offensive named Wacht am Rein on the Western Front during the final months of World War II. Twenty-four German divisions advanced against three U.S. infantry divisions and part of one armored division in the “quiet” Ardennes sector that belonged to Lt. Gen. Courtney Hodges’ U.S. First Army of Lt. Gen. Omar Bradley’s Twelfth Army Group. Hodges was using the quiet sector as a place to deploy newly arrived divisions to gain some experience patrolling the frontier and bring battered ones like those that experienced the meat grinder of the Hürtgen Forest back to strength. When the attack unfolded in mid-December, Hodges’ First Army had entered Germany at Aachen and was engaged against the Germans in the foreboding Hürtgen Forest northeast of the Ardennes. To the south, Lt. Gen. George Patton’s Third Army was battling entrenched Germans in the Saarland. On September 16, 1944, German leader Adolf Hitler announced to his senior generals his idea for a winter offensive in the West. At the time, 96 Allied divisions were arrayed against 55 German divisions on a 570-mile front. Hitler’s overly ambitious plan called for Colonel Group Leader Josef “Sepp” Dietrich’s Sixth Panzer Army and General of Panzer Troops Hasso von Manteuffel’s Fifth Panzer Army to advance into the Ardennes Mountains, cross the Meuse River, and wheel north to capture the port of Antwerp. While Dietrich drove straight for Antwerp, Manteuffel would follow closely to the west, protecting his left flank from counterattacks by Allied forces. Another German army, General of Panzer Troops Erich Brandenberger’s Seventh Army, would guard Manteuffel’s left flank. The offensive would be under the overall direction of Field Marshal Walter Model, the commander of Army Group B, who in turn reported to 60-year-old Field Marshal Gerd von Rundstedt, who was the commander in chief of German forces in the West. Hitler brought the highly decorated commander out of retirement to supervise the preparations for the important offensive. The intent of Wacht am Rein was to isolate and destroy four Allied armies: the U.S. 1st and 9th Armies, the Canadian 1st Army, and the British 2nd Army and, in so doing, force the Allies to the peace table. The veteran German senior commanders in the West thought it would be a miracle if their troops were able to reach the Meuse, much less get beyond it. “If we reach the Meuse we should go down on our knees and thank God,” said von Rundstedt. The German offensive involved 250 million German troops, 1,278 panzers and assault guns, and 2,600 artillery pieces. Sixth Panzer Army had eight infantry and five panzer divisions, Fifth Panzer Army had four infantry and three panzer divisions, and Seventh Army had four infantry divisions. The commanders of the two panzer armies were more different than alike, and their respective armies also had key differences. Dietrich, one of Hitler’s favorites, was a Nazi Party loyalist who lacked the seniority of many better qualified panzer generals. In comparison to Dietrich, Manteuffel was eminently more qualified for the assignment because of his training and experience. Dietrich would lead the SS panzer forces, whereas Manteuffel would command the Wehrmacht panzer forces. While Dietrich would attack on a narrow front and had access to substantial reinforcements, Manteuffel would attack over a broader front with limited access to reinforcements. Manteuffel’s discipline and ability to keep focused on the principal objectives of the offensive produced the greater potential for success as the attack progressed. The two powerful panzer corps that constituted Manteuffel’s Fifth Panzer Army were deployed behind the Our River at the start of the offensive. On the right was General of Panzer Troops Walter Kruger’s LVIII Panzer Corps, and on the left was General of Panzer Troops Heinrich Freiherr von Luttwitz’s XLVII Panzer Corps. The LVIII Panzer Corps comprised Siegfried von Waldenburg’s 116th Panzer Division and Walter Langhauser’s 560th Volksgrenadier Division. To its south was the powerful XLVII Panzer Corps, comprising Colonel Meinrad von Lauchert’s 2nd Panzer Division, Generalleutnant Fritz Bayerlein’s Panzer Lehr Division, and Generalmajor Heinz Kokott’s 26th Volksgrenadier Division. Because of the narrowness of Fifth Panzer’s front, Bayerlein’s division was deployed in a second line as a follow-on force. Arrayed opposite them on a 25-mile front behind the Our River was Maj. Gen. Norman D. Cota’s veteran 28th Infantry Division. Cota’s division was part of Maj. Gen. Troy Middleton’s VIII Corps. Cota’s division had fought in the Hürtgen Forest in November where it had lost 6,000 men. Although its losses had been replaced, the new troops were inexperienced. Middleton’s headquarters was situated in Bastogne, and Cota’s was based in Wiltz. The 112th held the north of the line and straddled both sides of the Our River, the 110th held the center with its headquarters at Clervaux, and the 109th held the southern end of the line covering the approaches to Wiltz. Dead American soldiers at a crossroads in Hinsfeld, Belgium. The soldier in the foreground has been stripped of his boots. At that point in the war, Middleton’s 69,000-man VIII Corps also included Maj. Gen. Alan Jones’s 106th Division, Maj. Gen. Raymond Barton’s 4th Infantry Division, and Maj. Gen. John W. Leonard’s 9th Armored Division. The 106th Division, which was untested in combat, arrived at the front on December 11 and deployed directly north of Cota’s 28th Division. Like the 28th Division, the 4th Division also was resting following combat operations in the Hürtgen Forest and was temporarily assigned to Middleton’s corps. Two of Leonard’s three combat commands, CCA and CCR, shored up the corps’ front line. CCR was deployed on the 28th Division’s left flank, and CCA was situated on the division’s right flank. Middleton’s also had four battalions of combat engineers he could deploy as infantry in the event of an emergency. For the Fifth Panzer Army to have any chance to maintain its ambitious schedule of reaching the Meuse River in three days, it would have to brush aside the American infantry manning the front line and seize control of several key towns that served as road hubs, such as St. Vith, Clervaux, and Bastogne. Bastogne, a market town of 3,500 residents where seven roads converged, was critical to the success of Manteuffel’s attack. Manteuffel knew Lauchert and Bayerlein could not afford to get bogged down in a protracted battle to capture Bastogne. 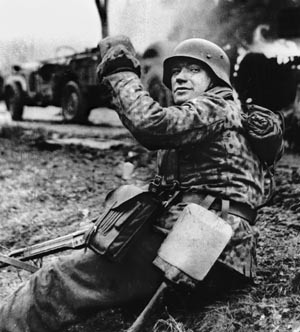 He had made it clear in briefings before the battle that Kokott’s slow-moving 26th Volksgrenadier Division would likely bear the brunt of fighting to secure Bastogne while the panzer units bypassed it. “Bastogne must be taken otherwise it will remain an abcess on our lines of communications,” Luttwitz told his division commanders. The Allied weather forecast for Saturday, December 16, indicated that snow would begin falling in the early afternoon, restricting visibility. None of Middleton’s headquarters units warned of a possible enemy attack. The relative quiet that morning was shattered at 5:30 as German railroad guns and gigantic field howitzers heaved their deadly shells into Allied positions along an 85-mile front in the eastern Ardennes. The Germans followed their initial fixed barrage with walking barrages. The barrages were designed to sever Allied telephone lines so units could not share information with their local headquarters. This prevented First Army’s units from knowing whether they were facing an isolated attack or a full-blown German offensive. As soon as their artillery stopped, German panzer grenadiers and volksgrenadiers began infiltrating enemy positions to surround and isolate the Americans’ forward positions. The troops of Kruger’s LVIII Corps found the Americans of the 112th and 110th Infantry Regiments in strong positions. The 112th Infantry held a six-mile-long bridgehead on the east bank of the Our River. It was situated in the Siegfried Line, the imposing system of defensive forts and bunkers built by Germany before the war. The Americans took advantage of the bunkers where possible. For that reason, it took time to pry them out of their positions. General-Major Siegfried von Waldenburg’s 116th Panzer Division had a complement of 43 Panthers, 26 Mark IVs, and 26 Jagdpanzer IV tank destroyers. His panzergrenadiers captured their first bridge over the Our River at Heinerscheid, but they failed the first day to secure a key crossing farther north at Ouren, where several bridges spanned the Our River. Colonel Hurley Fuller’s understrength 110th Regiment held a half dozen defensive positions between the Our and Clerf Rivers, some of which were manned only by a single platoon or company. Helping them slow the German onslaught were two artillery batteries that guarded the approaches to Clervaux and the crossings of the Clerf River. The scattered units of the 110th also had to contend with Colonel Walter Langhauser’s 560th Volksgrenadier Division. The volksgrenadiers took advantage of the seam between the 110th and 112th to make considerable gains at the start of the attack as they closed on the Clerf north of Clervaux. As the battered troops of the 110th Infantry streamed back toward Clervaux, Cota ordered a fresh battalion to reinforce Clervaux in expectation of a major clash the following day at the key crossing of the Clerf. Bearing down on Clervaux was Colonel Meinrad von Lauchert’s 2nd Panzer Division. The powerful division had 58 Panthers, 27 Mark IVs, and 48 self-propelled guns. Meanwhile, Kokott’s 26th Volksgrenadier Division made good progress toward the Clerf by overrunning a forward position of the 110th Infantry Regiment at Walhausen. The American infantry did its best with mortars and antitank guns to try to slow the advance of von Luttwitz’s XLVII Panzer Corps, but it proved difficult to stop. An American with a submachine gun engages enemy soldiers while a German half-track burns on a clogged roadway. Bottlenecks on key roadways bedeviled the German panzer columns. By the end of the first day, Fuller’s regiment had lost most of its forward positions. The Germans managed to drive the men of Company B of the 110th Infantry out of Marnach, but they failed to capture Hosingen farther south, where an American infantry company reinforced by an engineer company continued to hold on. As dusk fell over Hosingen, the Americans and Germans were fighting house to house through its narrow streets. To the delight of the beleaguered Americans, four Sherman tanks fought their way into the town that evening. Unfortunately, the infantrymen were running out of rifle ammunition. South of Hosingen, the Germans of the 26th Volksgrenadier attacking the town of Holzthum got a nasty surprise. When a volksgrenadier company tried to outflank the town to the north, it ran headlong into a company of U.S. M16 antiaircraft half-tracks mounting quadruple .50-caliber Browning machine guns. When used in the antipersonnel role, the fearsome weapon was dubbed the “Krautmower.” The gunners raked the 100-man company, sending its survivors into full retreat. The panzer advance in the south was slowed by the need to build a pair of 60-ton pontoon bridges to funnel Lauchert’s and Bayerlein’s panzers across the Our. Bayerlein had a wealth of armor, but it quickly became clear that it was going to take considerable time for its weight to be felt as the roads were clogged on the first day by units in front of it. Panzer Lehr had 30 Panthers and 27 Mark IVs. In addition, Bayerlein also commanded the 559th Panzerjaeger Battalion with 19 Jagdpanzers and the 243rd Assault Gun Brigade with 18 StuGs. At Fouhren on the west bank of the Our River, the 109th Infantry had to contend not only with elements of XLVII Panzer Corps, but also elements of the Seventh Army. The ground was steep in this sector, and the Germans advanced skillfully through defiles to infiltrate and outflank American positions. Fortunately, CCA of the 9th Armored Division was available to lend a hand to the hard-pressed grunts. Kruger’s LVIII Panzer Corps failed on the first day to capture Fifth Panzer Army’s northernmost crossing of the Our River at Ouren, so Manteuffel issued orders for the following morning designed to remedy the situation. The orders instructed Waldenburg to send a portion of his panzer troops to cross at Dasburg, which was the main crossing for Lauchert’s 2nd Panzer Division, and attack the rear of the American units at Ouren. Because Lauchert and Kokott had failed to clear the Americans from Hosingen, the crossings of the Our River remained clogged with vehicles. The bottlenecks on the roads leading west from the Our River crossings at Dasburg and Gemund prevented Bayerlein’s Panzer Lehr troops from joining the advance. Americans surrender to the Germans. Isolated American infantry units received orders to hold their ground to allow time for reinforcements to reach the battlefront. General Dwight D. Eisenhower, the Supreme Allied Commander in Europe, and Bradley met in Paris the first night of the German attack to discuss the situation. Bradley had driven four hours from his headquarters in Luxembourg City to meet with Eisenhower at SHAEF headquarters. The Twelfth Army commander, who was responsible for the Ardennes sector, deemed the German advance a diversionary attack designed to take pressure off Third Army’s offensive in the Saarland, but Eisenhower disagreed and issued orders for armored troops from the adjacent Allied armies to reinforce Hodges. Eisenhower instructed Bradley to detach Maj. Gen. William Morris’s 10th Armored Division from Lt. Gen. George Patton’s Third Army and detach Brig. Gen. Robert Hasbrouck’s 7th Armored Division from Lt. Gen. William Simpson’s Ninth Army. Both armored divisions received orders to move with all haste to assist Hodges’ army. The following morning Bradley departed for Luxembourg City. The situation on the second day of the German attack was particularly grim for the dispersed companies of Fuller’s 110th Infantry Regiment. They held a six-mile-front under heavy pressure at all points. Fuller directed his troops from his regimental headquarters at the Claravallis Hotel in Clervaux. In Hosingen some of the Americans had run out of rifle ammunition and were forced to fight with grenades. From his headquarters in Wiltz, Cota admonished his infantry companies on the east side of Clervaux to hold their positions at all costs and denied all requests to regroup behind the Clerf River. Middleton was busy to distributing parts of his paltry divisional reserve forces to the battlefront. He dispatched four tank destroyers from the 811th Tank Destroyer Battalion of 9th Armored’s CCR to Ouren and a company of self-propelled antitank guns to Clervaux. As instructed by Manteuffel, Waldenburg sent 13 Panther tanks, nearly one-third of his Panthers, north to dislodge elements of the 112th Infantry Regiment from Ouren. The Americans at Ouren, who were in danger of being ground under the treads of the formidable Panther tanks, called for armor support, and a platoon of tank destroyers answered their call. Waldenburg lost four Panthers but succeeded in dislodging the Americans from Ouren. On the morning of the second day, Lauchert’s panzers fought off a spirited counterattack by American tanks attempting to retake Marnach east of Clervaux. Tank battles occurred between Sherman tanks of Company A of the 707th Tank Battalion and Lauchert’s sturdy Panzer Mark IVs. Kokott’s volksgrenadiers, who were armed with highly effective panzerfausts, assisted the panzer troops by knocking out a total of 11 American tanks. A major battle shaped up for Clervaux. The town was crucial to the Germans because it had a bridge over the Clerf River and was the principal paved road to Bastogne. The volksgrenadiers marching to Clervaux were backed by Panther and Mark IV tanks of Lauchert’s 2nd Panzer Division. Fuller dispatched three platoons to form a line on high ground east of Clervaux to contest the German advance. Lauchert launched a well-executed, two-pronged strike against Clervaux. He sent one armored column to the northeast to roll up the flank of the Americans defending the eastern approaches to the town and another armored column to hook around the American defenses and secure the bridge. When a dozen German tanks, among them the imposing Panthers, prepared to advance line abreast against Clervaux, some of the American self-propelled antitank guns beat a hasty retreat. One driver apparently was gripped by a terror so great that he overturned his vehicle in his haste to get away from the Panther tanks. Despite having artillery and armor to support them, the American infantry could simply not hold Clervaux in the face of such formidable odds. As for the Americans ordered to stand firm in Hosingen, they held out until noon on the third day when 320 riflemen and engineers surrendered. The loss of Clervaux and Hosingen opened a 12-mile breach in the middle of the 28th Infantry Division’s line that the Germans would exploit on the third day. Eisenhower’s only reserve consisted of Maj. Gen. Matthew Ridgway’s XVIII Airborne Corps, comprising the crack 82nd and 101st Airborne Divisions, which were resting and refitting in Reims following Operation Market Garden. On the morning of December 17, Eisenhower transferred Ridgway’s corps from his reserve to First Army’s reserve. Bradley issued orders for the XVIII Airborne Corps to embark by truck immediately for the Ardennes. After delaying the Fifth Panzer Army’s attack along the Our River, men of the 28th Infantry Division withdrew to Bastogne. Brigadier General James Gavin led the 82nd, while Brig. Gen. Maxwell Taylor led the 101st. Since both Ridgway and Taylor were in England at the time, command of the corps devolved to Gavin and command of the 101st went to the short, plucky Brig. Gen. Anthony McAuliffe. He received his orders at 8:30 PM, December 17, and the convoy of 380 trucks carrying the 11,840 men of the 101st got under way shortly after midnight on the 100-mile trip to Bastogne. Although initially both divisions were earmarked for Bastogne, the 82nd would be put into a blocking position 30 miles north of Bastogne at Werbomont. At the beginning of the third day, Manteuffel’s panzer troops had secured crossings of the Clerf River and were traversing the Wiltz Valley. General Middleton sent small task forces of engineers, artillery, and tanks or tank destroyers to slow the German advance. These task forces were not expected to defeat the stronger German columns, but simply to buy time for reinforcements to arrive at Bastogne. The following morning, Colonel Joseph Gilbreth’s CCR of the 9th Armored Division did its best to slow the German panzer juggernaut on the main Clervaux-Bastogne road. Captain L.K. Rose’s Task Force and Lt. Col. Ralph Harper’s Task Force would man roadblocks across the northern and southern routes to Bastogne. For the XLVII Panzer Corps, the race to Bastogne was on for Luttwitz had learned through intercepted American radio transmissions late on the second day that the Americans were sending their elite airborne troops to Bastogne to reinforce the key town. Bastogne was crucial to the Germans because it would afford them the most direct routes to the Meuse crossings. Task Force Rose had set up five miles west of Clervaux and 14 miles east of Bastogne during the early morning hours of Monday, December 18, on the Clervaux-Bastogne road. Rose had a company of Sherman tanks, an armored infantry company, and a platoon of armored engineers. The Germans advanced on the ridge where Rose’s force was deployed at 10 AM. Panzergrenadiers fanned out into the woods on both sides of the road and probed the position. A short time later Mark IVs and Panthers of the 3rd Panzer Regiment arrived to engage the Shermans. It was a grueling six-hour battle in which the Americans sought to hold their ground but saw their Shermans transformed into burning wrecks. The troops of Task Force Harper awaited farther west. Harper had elements of the 2nd Tank Battalion and two companies of the 52nd Armored Infantry Battalion. Harper guarded the intersection near Allerborn nine miles from Bastogne where the road from Wiltz joined the Clervaux-Bastogne road. Lauchert’s panzers approached the American defenders in the gloaming and quickly overran two American tank platoons. The Shermans could not stand their ground in the face of the more powerful Panthers. The fire from the panzers’ machine gunners swept the ground, killing and maiming the American infantrymen. When Harper was slain, they pulled back to Longvilly, and Lauchert’s 2nd Panzer Division peeled off north on its drive to the Meuse. While Lauchert’s 2nd Panzer Division had been fighting the task forces on the northern routes to Bastogne on the third day, Panzer Lehr crossed the Clerf River near Drauffelt. Colonel Ludwig Heilmann’s 5th Parachute Division advanced on a parallel route to the south. Wiltz lay in the direct path of Panzer Lehr, the 26th Volksgrenadier Division, and the 5th Parachute Division. The Americans had strengthened the forces defending Wiltz by sending tanks and assault guns and the 600 men of the 44th Engineer Combat Battalion, but it was only a matter of time before it fell to Kokott’s volksgrenadiers and Heilmann’s paratroopers. Bayerlein had a dubious combat record. Indeed, Manteuffel had serious reservations about his ability to command such a panzer division under pressure. Bayerlein made the rookie mistake of asking Belgian citizens for information on the location of the American forces. They gave him misleading information. Specifically, they told him that a force of Americans held Margaret, a short distance east of Bastogne, with 50 tanks. If he had been bold and daring, he conceivably could have reached the outskirts of Bastogne on the third day. His delay not only allowed various forces to reinforce Bastogne, but also allowed Middleton to deploy a fresh set of task forces to screen the approaches to Bastogne via the towns of Noville, Longvilly, and Wardin. While the two task forces were trying to slow Luttwitz’s panzer juggernaut, Middleton was briefing the commanders of the reinforcements that began arriving in Bastogne that afternoon. The first to arrive was Colonel Roberts, the leader of CCB of the 10th Armored Division. McAuliffe, whose 101st Airborne Division was placed temporarily under Middleton’s command, arrived at 4 PM. Middleton ordered Roberts to divide his combat group, which was composed of Sherman tanks, half-tracks, and armored scout cars, into three sections that would each block a road into Bastogne. The task forces moved into position under cover of darkness on the night of December 18-19. The sacrifice of Cota’s division in the first three days of the German offensive had put Kokott’s and Bayerlein’s divisions 36 hours behind schedule. Beginning on December 19, the defense of Bastogne was largely in the hands of the elite paratroopers and glider troops of the 101st Airborne and the armor and artillery that arrived to support them. The vanguard of the 101st, which consisted of Colonel Julian Ewell’s 501st Parachute Infantry Regiment, arrived in Bastogne at midnight on December 18-19, and the other three regiments arrived the following morning. In addition, the 705th Tank Destroyer Battalion of the Ninth Army rolled into town as did various artillery regiments with instructions to support the paratroopers. Of the seven artillery battalions that eventually would deploy at Bastogne, three were armed with the formidable 155mm “Long Tom” howitzers. 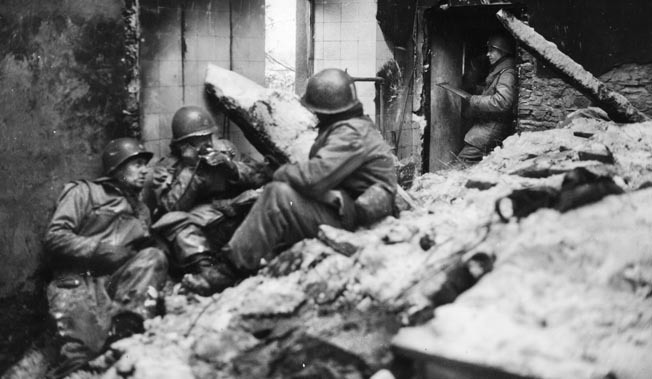 Americans at the 28th Infantry command post in Wiltz. The Germans shelled the key town in an effort to force the Americans to give up. Heading five miles north to defend Noville was a team led by 26-year-old Major William Desobry. He had 400 men, 15 Sherman tanks, and a platoon of M-10 tank destroyers with which to grapple with Lauchert’s panzer regiments. They arrived at 2:30 PM and waited for the Germans to arrive. Thick morning fog on Monday morning prevented the Americans from seeing anything at a distance. In an old cemetery at Noville, crews manned 57mm antitank guns, and bazooka teams hunkered down ready to spring into action. Out of the mist loomed German Panthers, and the Americans knocked out two in quick succession. The Germans began a series of probing attacks. 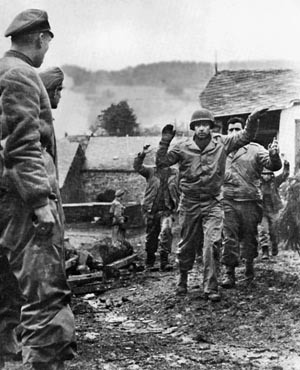 American morale soared when the 1st Battalion of the 506th Parachute Infantry arrived from Bastogne. The tough airborne troops advanced against the Germans with the Shermans providing fire support. The Germans had more men and more tanks, though, and they drove the paratroopers back to the village. When it finally fell back south toward Bastogne, Task Force Desobry had delayed elements of Lauchert’s panzer division an entire day. Lieutenant Colonel Henry Cherry was ordered to take his task force east to Longvilly, and Lt. Col. James O’Hara was to deploy his task for three miles to the southeast of Bastogne at Wardin. 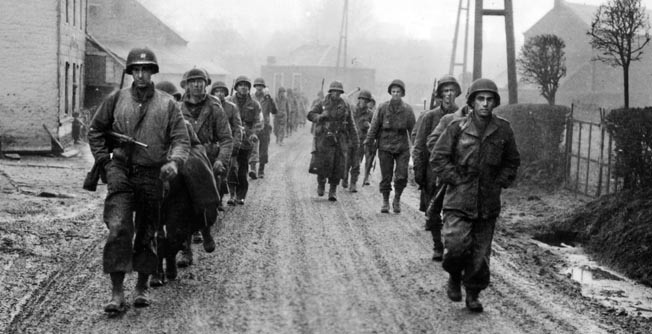 Cherry’s task force could not reach Longvilly because the route was packed with retreating U.S. vehicles and troops from the earlier attempts to slow the Germans advancing on the Clervaux-Bastogne road. When Cherry learned that the vanguard of the Panzer Lehr Division was in Margaret in his rear, he withdrew to Neffe. Task Force Cherry’s rearguard under Lieutenant Edward Hyduke, the leader of a tank battalion, used their Shermans effectively against a pack of Mark IVs that blunted the German advance on the main road. Luttwitz arrived at Oberwampach, which lay southeast of Longvilly, to personally supervise Bayerlein’s advance. He had arranged for Lauchert, who was directing his division’s advance to the northwest at Chilfontaine on the Clervaux-Bastogne road, to send a battery of 88mm flak guns south to knock out American howitzers that had shelled Bayerlein’s panzer column. The flak gun crews opened up on Hyduke’s Shermans and together with Bayerlein’s panzers destroyed the American rear guard. Meanwhile, the gridlocked Americans tracked and wheeled vehicles attempting to withdraw west toward Margaret from Longvilly found themselves cut off and surrounded by German forces. At 1 PM Germans tanks and flak guns began firing into the trapped line of vehicles. In 90 minutes they had destroyed the trapped column. After rounding up American prisoners who survived the carnage, the Germans marched on Neffe. Cherry’s troops set up a defensive position in a chateaux on the south side of the road, taking automatic weapons from their vehicles and propping them up in windows of the old building. As the two sides clashed, mortar crews on both sides dropped rounds into their tubes. When the German fire became too severe, Cherry disengaged and led the survivors toward Bastogne. Eisenhower met the senior generals at Verdun on Tuesday, December 19, to discuss how best to quickly and efficiently contain the German thrust. When asked by Eisenhower how quickly he could reinforce Hodges’ army, Patton said he could have three divisions deployed against the Germans on the left shoulder of the bulge by Friday, December 22. Patton issued orders for Maj. Gen. Hugh Gaffey’s 4th Armored Division to concentrate at Longwy and head north 40 miles to the left shoulder of the bulge. He also instructed his chief of staff to find transportation for the 80th Infantry Division that would start out that day for the battlefront and be followed on December 20 by the 26th Infantry Division. 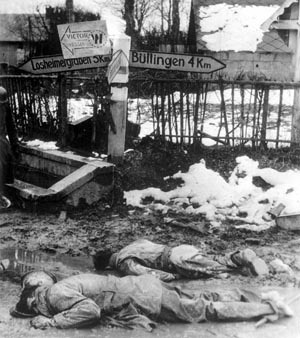 Luttwitz’s three division commanders favored an attack by the entire XLVII Corps against Bastogne to open up the roads leading west from the town to the Meuse River. Manteuffel flatly refused on the grounds that it was contrary to their mission; however, he passed the request up the chain of command. The staff of Army Group B told him that Bastogne was not the main objective and did not merit such a concentration of force. The final blow to the beleaguered 28th Infantry Division defenders of Wiltz began at 2:30 PM on December 19. That morning Cota had relocated his headquarters to Sibret southwest of Bastogne. The 3rd Battalion of the 110th Infantry retreating from the village of Nocher had recently arrived in the town. 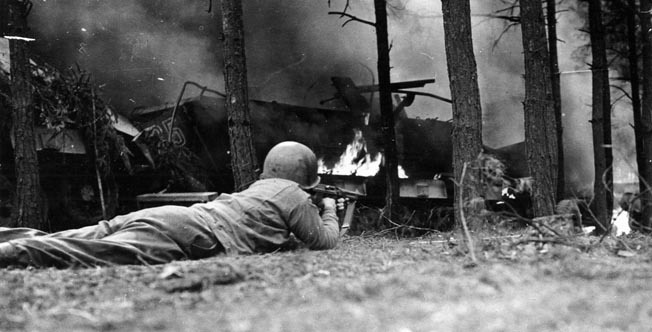 Paratroopers of the 5th Parachute Division backed by 40 tanks and assault guns assailed the town from three sides. German assault teams whose members were armed with submachine guns trotted alongside the tanks spearheading the attacks. The Germans smashed through the weak perimeter in several places. With few choices left to them, the Americans received permission that evening to break into small groups and try to escape west under cover of night. On December 20, the fifth day of the German offensive, Kokott’s volksgrenadier division spread out around the Bastogne perimeter with the intent of encircling the Americans. It would take them two more days to complete their encirclement, though. By that time the German advance had slowed considerably. German regiments advanced cautiously for fear of running into an American ambush. The Americans were contained within a perimeter that was only five miles wide. For the next several days, the Germans were content to keep the units inside Bastogne contained. During that period, McAuliffe ordered his artillery units to conserve their ammunition. On the Fifth Panzer Army’s right flank, Kruger’s LVIII Panzer Corps did not capture St. Vith until December 21. The Germans had hoped to capture St. Vith on the second day of the offensive, but it took them four more days than they originally planned to secure the vital road hub. Elements of Hasbrouck’s 7th Armored Division and CCB of the 9th Armored Division had buttressed the two American infantry regiments that held on at St. Vith, thwarting the Germans’ attempts to break out beyond the town. By the time the surviving Americans pulled out, Gavin’s 82nd Airborne had taken up a blocking position at Werbomont east of the Ourthe River. It took the LVIII Panzer Corps two more days to outflank the hardy paratroopers and their supporting armor and field guns. The crack 101st Airborne Division shored up the defense of Bastogne and played a major role in preventing the Germans from achieving their objectives on the south side of the bulge. McAuliffe was growing increasingly anxious about the situation inside the perimeter. The Americans had an acute shortage of medical supplies, food, and ammunition. On December 22, Maj. Gen. Gaffey informed McAuliffe by radio that the vanguard of the 4th Armored Division was just 20 miles south of Bastogne. However, Gaffey’s combat commands had encountered stiff opposition from Heilmann’s 5th Parachute Division of the Seventh Army and it would likely take at least several more days before one of them reached Bastogne. With the American forces at Bastogne contained inside the perimeter, the reconnaissance battalion of Panzer Lehr was able to race around Bastogne to the south and reach St. Hubert. This put Bayerlein’s reconnaissance troops only 30 miles from the Meuse River. The Germans completed the encirclement of Bastogne on December 22. This prompted Luttwitz to demand the Americans’ surrender. A pair of German officers carried Luttwitz’s ultimatum to McAuliffe. It stated that if the Americans did not surrender immediately they could expect total annihilation. When word of the response spread throughout the senior leadership of the Fifth Panzer Army, Manteuffel and his generals were furious. They vowed to crush the Americans in Bastogne for their insolence. After a week of low cloud cover, a high-pressure system that brought clear skies and subfreezing temperatures enabled Allied high-altitude bombers, fighter-bombers, and transport aircraft to take to the skies on December 23. This made it possible for the Americans to begin the first of 241 flights by C-47s that delivered 144 tons of supplies to the troops hunkered down inside the Bastogne perimeter. 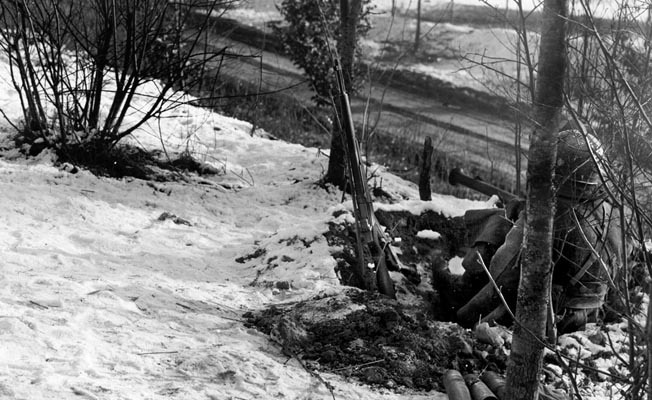 That day the Germans launched a concerted attack against Bastogne’s perimeter. The most successful of these was launched by the 901st Panzer Grenadier Regiment of the Panzer Lehr Division, which broke through the southwestern sector of the perimeter. Fighting raged well into the evening as panzergrenadiers and the men of the 2nd Battalion, 327th Glider Infantry, fought house to house in the village of Marvie. Manteuffel had worked tirelessly to obtain reinforcements that could be used to ensure the destruction of the American forces in Bastogne, but the Germans were hampered not only by a severe shortage of fuel, but also by the presence of the P-47 Thunderbolts that relentlessly attacked German panzer formations. Although he had promised Luttwitz that the 15th Panzergrenadier Regiment would arrive with its two panzergrenadier regiments and 72 tanks and assault guns, only one of the panzer regiments made it to the outskirts of Bastogne. When it attacked on Christmas morning, its force of 18 Mark IVs was not sufficient to overwhelm the American reserves inside Bastogne’s perimeter. After the repulse, Manteuffel informed Model that he would not approve any more large-scale attacks against Bastogne because they were too costly. On December 26 the vanguard of Colonel Creighton Abrams’ CCR of the 4th Armored Division fought its way north through Assenois and reached Bastogne at 5 PM. This ended the siege. Two days later, with Hitler’s permission, the Germans gave up their failed offensive and withdrew their most exposed forces. The Battle of Bastogne, a small part of the much larger Battle of the Bulge, cost approximately 3,900 American lives and 12,000 German lives. The Americans and British were soon driving east in a quest to retake the ground lost to the Germans. On January 13, British and American troops linked up in the center of the bulge. It took the Allies three more weeks to push the Germans back to their pre-attack positions. Hitler had taken a great gamble and lost. The Allies continued pumping more men and material into the Western Front to hasten the fall of Nazi Germany. After Wacht am Rein, Hitler did not have another ace up his sleeve. Tags 101st Airborne, 28th Infantry Division, 9th Armored Division, Adolf Hitler, Ardennes, Bastogne, Battle of the Bulge, Creighton Abrams, Fritz Bayerlein, George Patton, Hasso von Manteuffel, hosingen, Meuse River, Military Heritage May 2018, Panzer, Panzer Lehr Division.